Consumer Guide’s test Audi Q3 2.0T Quattro arrived with several options that boosted its $34,600 base price to $39,175, including destination. It seems the sport-ute pie can’t be cut into thin enough pieces. Witness the five new compact SUVs that are coming on board for 2015, all of which are essentially smaller, subcompact entries. And that’s just in the “regular” Compact SUV segment. There’s not as much upcoming action in the Premium Compact segment, but there’s some. And one of those “actions” is Audi’s new Q3, which joins the company’s existing Q5 compact as its smaller sibling. The Q3 is 10 inches shorter than Audi’s other compact SUV, the Q5, which results in a reduction in both passenger and cargo space. How much smaller? Compared to the Q5, the Q3 is 10 inches shorter, 2.6 inches narrower, and 2.6 inches lower on an 8-inch-shorter wheelbase. As might be expected, somewhat of a “hit” is taken in passenger and cargo space. Headroom is down by 2.4 inches in front, 1.6 inches in back. Legroom drops by 1 inch in front and a whopping 6.3 inches in back. And cargo space is decreased by a sizable 10 cu ft. But the price of the Q3 is also smaller. 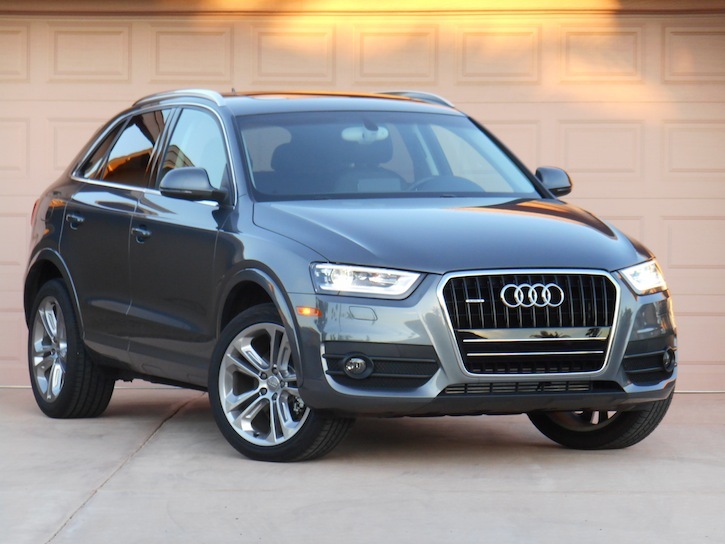 In an apples-to-apples comparison with the Q5 2.0T Quattro, a similar Q3 costs $4300 less. ($39,825 with destination vs. $35,525.) Furthermore, the Q3 is offered in a front-drive version the Q5 isn’t, which brings the price of entry down about another $2000. Unlike the Q5, which is offered with three engines (2.0-liter turbo, 3.0-liter V6, and 3.0-liter turbodiesel V6), the Q3 is offered with only one: the Q5’s base 2.0-liter 4-cylinder turbo rated at 200 horsepower. 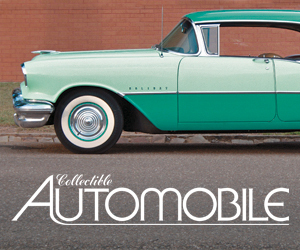 The lone transmission offering is a 6-speed automatic. Our test vehicle arrived as an all-wheel-drive Quattro version with optional navigation system ($1900), 19-inch alloy wheels (replacing standard 18s for $800), “Monsoon Gray” metallic paint ($550), and a power liftgate ($400). With destination, the total came to $39,175. Inside, Q3 follows typical Audi practice with a look of subdued quality. Nearly 40 grand seems like a lot for a small SUV, but not so much for a premium one. While there’s nothing really flashy here, in typical Audi form, the Q3 exudes a somewhat stately elegance both inside and out. Interior materials match the price, though some surfaces—such as the door tops—aren’t so much “padded” as just “covered,” albeit that covering appears to be leather. Also reflecting its price are the Q3’s solidity and quietness. Bumps produce only a muted “thud,” and highway wind and road noise are low. A suspension that seems a bit stiff at around-town speeds settles down nicely at freeway speeds, making the Q3 a fine long-distance cruiser. The engine does its part by emitting just a rich, muffled whine when prodded, and despite a rather unimpressive (for a turbo 2.0-liter) 200-horsepower rating, it provides good highway passing power, aided by the transmission’s quick kickdowns. In 273 miles of about 75 percent highway driving, we averaged an impressive 26.6 mpg, though that was on required premium-grade gas. The engine also feels quite strong in around-town driving. Unlike most turbos, it provides a decent (though hardly “strong”) jump from a stop when the throttle is stabbed and builds power in a very linear fashion, all of which makes it easy to slice-and-dice through traffic. Somewhat less impressive at low speeds is the ride. European manufacturers tend to favor stiffer suspensions, and Audis have traditionally been no exception. Q3 follows this trend, reacting somewhat more sharply than the norm over smaller road irregularities. The upside, however, is that steering and handling are on the sporty side for an SUV, aided in part by the vehicle’s tidy dimensions. Q3’s infotainment screen is permanently affixed atop the dashboard, with the controls being mounted mid-dash within easy reach. Climate controls, however, are mounted very low and are slightly recessed, which makes for rather awkward access. Another way in which the Q3 follows current Audi practices is in its control layout, though with a few variations—some good, some … not. The company’s MMI infotainment interface has never been one of our favorites, and though execution is somewhat different in the Q3, it’s still not a strong point. 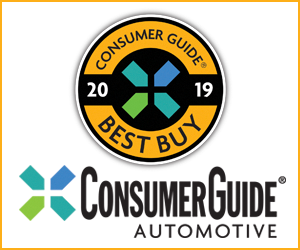 As with many of its ilk, the initial confusion is lessened as you use it, but the complexity of having to step through multiple screens and buttons to make what should be simpler adjustments will continue to take your eyes off the road even with familiarity. On the positive side, the screen is perched on top of the dash, where it’s closer to your line of sight (and some might say, a little unsightly). Furthermore, Q3’s main control knobs and buttons are on the dash rather than Audi’s traditional location on the console, which puts them within easy reach and—likewise—closer to your line of sight. But that may have prompted moving the climate controls into a low recess of the dash, where they’re quite awkward to see and reach. Adding to the inconvenience are slow-to-adjust, repetitive-step temperature and fan controls, though the individual mode buttons are much easier to use. That’s all less of an issue because our test Q3 had automatic climate control—which doesn’t have to be adjusted as often—but any adjustments you do have to make can be tedious. Interior storage isn’t particularly impressive, either. There’s a modest glovebox, a small console box with iPhone jack, two open cupholders, a tiny forward console tray, and map pockets in the doors. 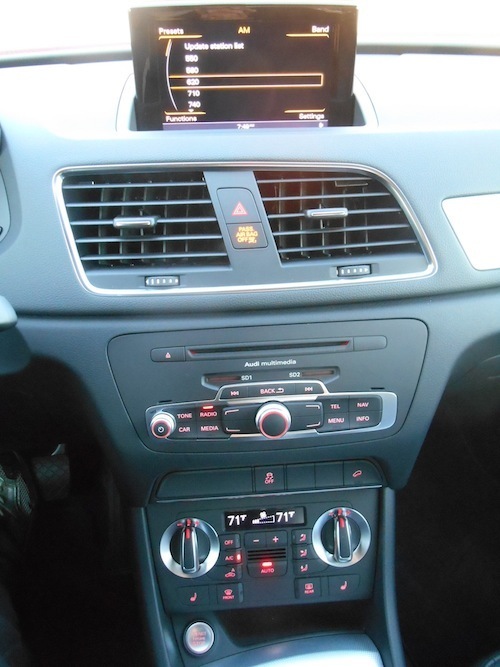 There’s a 12-volt outlet on the console and two SD-card slots on the dash, but oddly, no USB or Aux jacks. As might be expected given the Q3’s size, passenger and cargo space are on the cozy side for the class. Headroom is adequate, and the front seat can be moved far back to accommodate even very tall drivers, but doing so severely cuts rear-seat legroom behind them. Average-size adults sitting in tandem is about the max. We found the front seats comfortable, but shorter folks may find their tall side bolsters make climbing out of them a bit difficult. Visibility is good to the front, rather poor to the sides due to thick and close roof pillars, and decent to the rear corners, though we were surprised—and not in a good way—that there was no rearview camera. It was also surprising that the sun visor, when swung to the side, didn’t extend to cover the whole window—an odd cost-cutting move. Q3’s compact cargo area can be expanded by folding the rear seat backs, which lie flush with the cargo floor. There’s also a separate ski pass-through and a cargo-floor net, both nice touches. Cargo space behind the rear seat is not as sizeable as in most compact SUVs, but it’s still quite good. 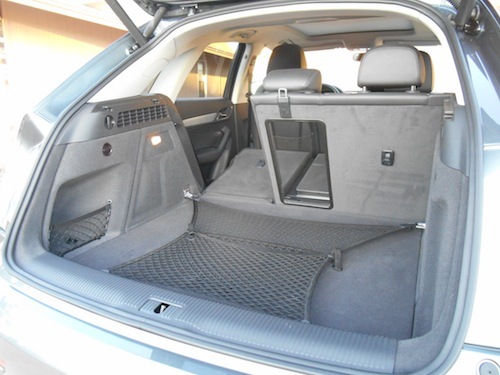 Furthermore, the rear seat backs fold level with the cargo floor and nearly flat, and there’s also a ski pass-through. However, there are only two small underfloor bins mounted far forward out of easy reach, and there’s a 2-inch step from the floor to bumper level, so you can’t just slide large boxes out. It’s long been a trend that each new generation of a vehicle gets a little bit larger, and there’s no question that some of today’s compact SUVs are not as compact as they used to be. Thus the recent crop of smaller compacts are not so much “new” as they are “revived,” and may well be attractive to those who’d rather have superior parking maneuverability, lower prices, and better fuel economy than the outright space. 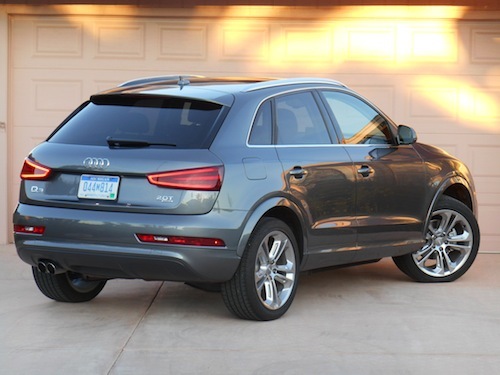 And to such buyers who want to go upscale, the Q3 makes a lot of sense. Written by: The Daily Drive staff on January 5, 2015.on March 22, 2019.